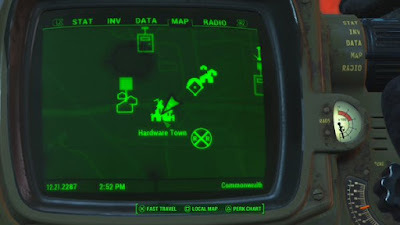 - You’ll find Hardware Town a few streets to the southwest of Diamond City. Upon arrival you’ll see a Settler who insists that ‘she’ is hurt; follow the woman inside. There are Armor and Weapon Workbenches behind the front desk, back where the Settler wanted you to go. Hardware Town has a basement that’s accessible multiple ways (two holes in the floors, another exit to the street, and plain ‘ol stairs). Along with a slew of bodies - former victims? - there’s a locked Novice toolbox down here with nothing special inside. You can reach the second floor via the stairs in the warehouse, as well as an improved ramp that runs through the bathroom from the basement. The open room up here contains a steamer trunk with various goodies. There’s also an issue of Picket Fences on the desk. At the end of the hall is an Advanced locked door; inside you’ll find a Bottlecap Mine, a Stealth Boy, several other lesser items in boxes and bags, and a Master locked safe. Shockingly, the safe doesn’t contain anything particularly good - just a bunch of ammo. - Almost done. First, have a look at the rear of Hardware Town, through the door at the back of the warehouse. There are two Raiders out here chatting about their scam, and they have a funny story to tell. Listen to them for a bit before taking them out. You can find a Power Armor Station out back.